Former Indian skipper MS Dhoni is among the most loved and widely respected cricketers across the globe. He is like a demi god for his fans who get crazy just to catch a glimpse of him. Similar was the case when MS Dhoni walked out to bat during the second T20I against New Zealand at the Eden Park in Auckland. The veteran was greeted by a rousing reception by his fans at the stands when he walked out to bat. 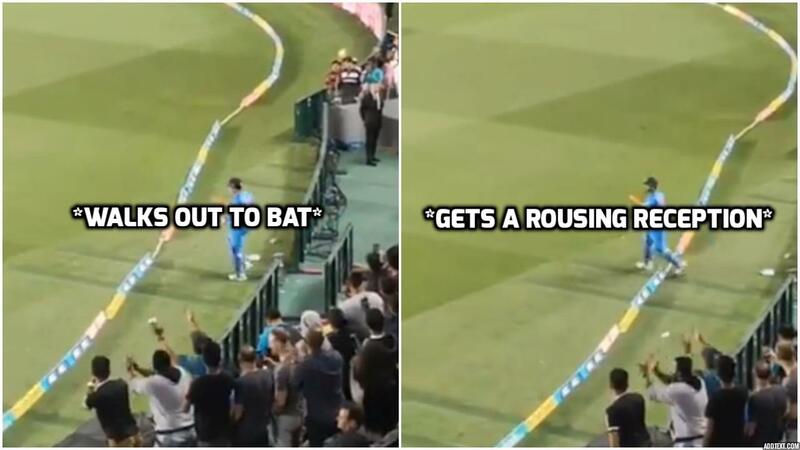 Fans were ecstatic to catch the sight of him coming out to bat and couldn’t stop cheering their hero. India still needed 41 runs to win the game from 38 balls. The 37 year old remained unbeaten on 20 off 17 balls alongside Rishabh Pant(40 off 28 balls) to steer the visitors to comfortable 7 wicket win with seven balls to spare. Earlier in the match, openers Shikhar Dhawan(30) and Rohit Sharma set the game for India with a 79 run partnership for the first wicket before Pant and Dhoni finished it off with an unbeaten 44 run stand for the fourth wicket. With the win in the second T20I, the men in blue drew level with hosts New Zealand ahead of the decider to be played at Hamilton on Sunday.